2017 witnessed a slowdown in the wave of exploration and production bankruptcy filings, while the expected increase in midstream filings never quite came to fruition. Meanwhile, the rising popularity of fundraising through rights offerings in the distressed energy space and the potential for more tie-ups between distressed companies are setting the stage as potential trends in the year ahead. 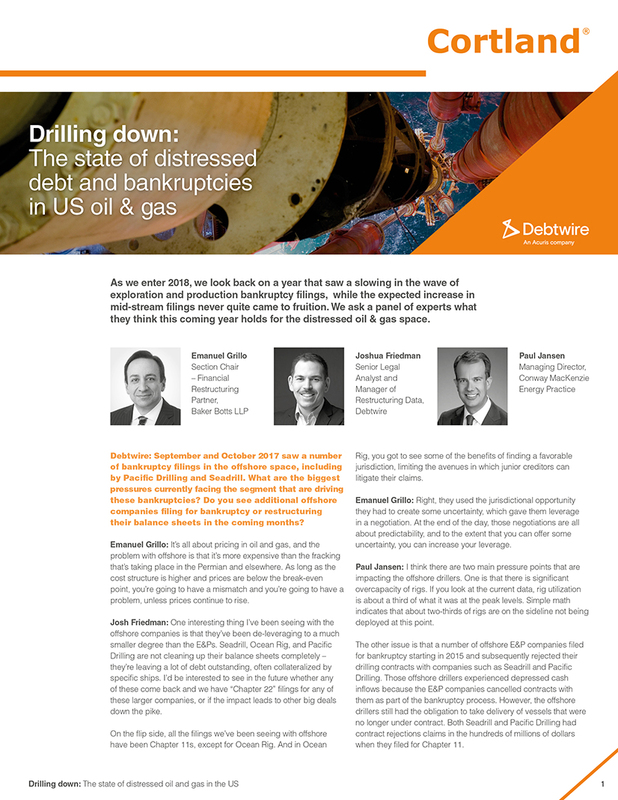 In order to explore distressed debt and bankruptcy activity in the US oil & gas space for 2018, Debtwire, on behalf of Cortland Capital, interviewed leading experts for their insights. Will rights offerings continue to be a popular financing option in the distressed oil & gas space in 2018? How has the Sabine Oil & Gas ruling impacted midstream agreements over the last 12 months? What segment of the oil & gas sector will continue to need significant restructurings?